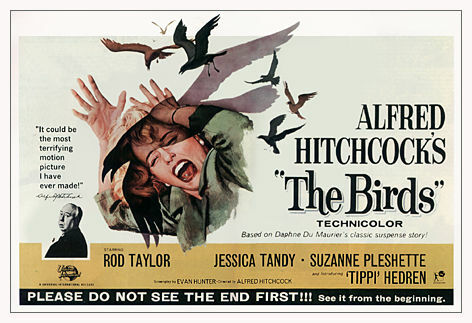 Hitchcock's classic about a woman (Hedren) and mass bird attacks that follow her around isolated California community. Not for the squeamish; a delight for those who are game. Hold on to something and watch. Script by Evan Hunter, loosely based on Daphne du Maurier's story. Hitchcock tried to hire Joseph Stefano (writer of Psycho) to write the script, but he wasn't interested in the story. Hitchcock spotted Tippi Hedren in a diet drink commercial. 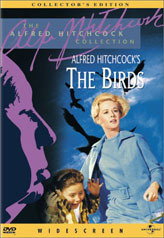 The scene where Tippi Hedren is ravaged by birds near the end of the movie took a week to shoot. The birds were attached to Tippi's clothes by long nylon threads so they could not get away. 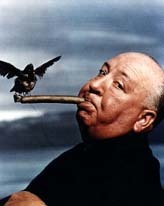 The film does not finish with the usual "THE END" title because Hitchcock wanted to give the impression of unending terror. Hitchcock makes his cameo appearance at the start of the film walking two dogs past the pet shop (the two terriers were actually his own).